Folk Devils, the late Ian Lowry’s amazing malcontent post punk noirists may be found in conversation with Tony Bugbear at Boogaloo Radio just there bedded behind their very fetching artwork….Also to be heard here, Tony and Julie Hamill talk to Terry Edwards and get some marvelous tales of The Dublin Castle, tales of extraordinary Madness. And killer diller tunes naturally, including an absolute all the solar system exclusive type spin of the new Gary Clail Soundsystem release ‘Ring The Changes’. It’s a banger too, so get to the Bell Inn in Bath May 11th and see Gary unveil his new material at last. 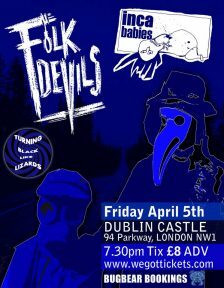 Folk Devils released several acclaimed singles including “Hank Turns Blue” and “Beautiful Monster” and recorded several sessions for BBC Radio’s John Peel Show. Musically their heady brew of swampy rock on a bed of bastardized blues created a vehicle for Lowery’s increasingly misanthropic worldview. 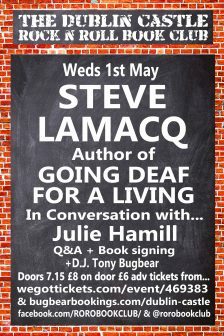 A well-honed gutter poet since the early days of punk, Ian developed an idiosyncratic style, fusing a natural gift for sly wordplay and a well turned snarky phrase with his often vitriolic and poignant lyrics channeled through an explosive onstage persona. Ian Lowery sadly passed away in 2001. The band reformed in 2016 with new singer Dave Hodgson (once of Parting Shots) to celebrate the release of the retrospective CD/2xLP “Beautiful Monsters” featuring remastered audio of all the band’s studio and demo recordings. 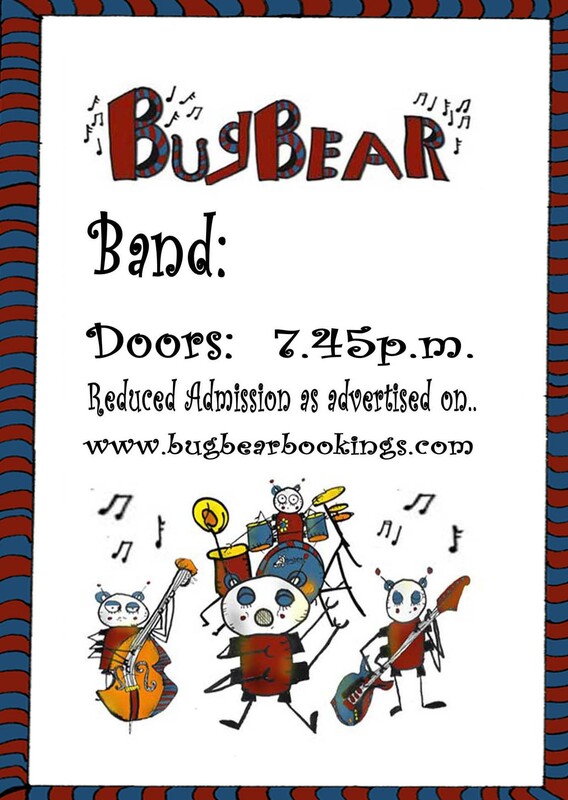 Big faves of Bugbear back in the day, finger poised on the pause button as Peely played the underground hits. Fantastic to host their appearance tonight, and with such superb support too. Inca Babies were formed in Manchester’s infamous Hulme district in 1982 and their music was a raunchy Death Ray twang from a punk-trash, Americana perspective. John Peel and his producer John Walters heard the Inca’s first single The Interior and offered them a session. It was to be the first of four they did for Radio 1 between 1984-87. Back again after many challenges and tribulations, Inca Babies are going strong, and it’s great to have them in the DC tonite. Perfect partners for The Folk Devils. As are opening act Turning Black Like Lizards. Classy and indeed classic Brit indie noir reference points. A bit of Bunnymen, some Jesus and Mary Chain and Joy Division/New Order for sure. A very fine performance and assured at that, with beefy drums, clinically cool guitars, probing bass and a calm yet powerful vocal. All very cool indeed. A Body Of People blend the psychedelic nuances of Julian Cope with bouncy, rocking Doors/Caravan/Stranglers fare (thanks to some smashing arpegiotastic keys), and a tinge of that Barrett/Ayers counter cultural heritage, all envisaged thru a punky party lens mind you geezer, and we understand a new album is on the way….Time Dilation Unit open for us on April 6th, one of the hottest to trottest space skronk bands around, effortlessly pulsating all manner of spatially aware, stomping, rocket fueled psychedelic space circus glam/rock.